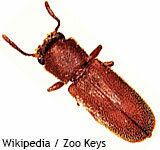 The adult beetle is rarely seen but lays eggs in the wood after chewing through the surface. The larva feed off the interior of the wood for up to one year before becoming an adult beetle. The larva stage of the beetle is what does structural damage to buildings. A complete and thorough inspection is recommended.